The best way to get to know a community is by scheduling a tour. See the facilities, meet the staff and residents, and get a feel first hand what it's like to live at Brookdale Westampton Memory Care. Welcome to Brookdale Westampton, a caring senior community specializing in Alzheimer's and dementia care. Our community (formerly known as Clare Bridge of Westampton) features peaceful surroundings and a homelike ambiance, and combined with individualized care from specially trained staff, our residents can feel a sense of reassurance and meaning in their everyday lives. Located in Westampton Township in New Jersey, our comfortable community is conveniently located off I-295 with easy access to several medical facilities. 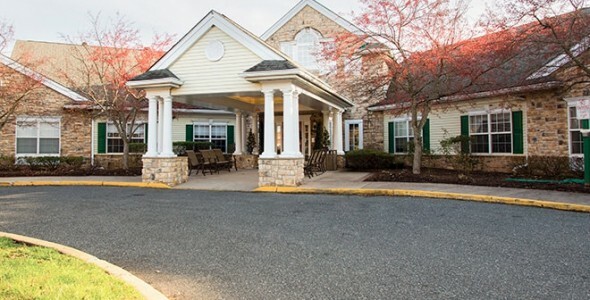 A part of Brookdale, a company dedicated to providing retirement options for seniors since 1978, Brookdale Westampton operates with vision, commitment and keen sense of detail to provide a high-quality senior living experience to all its residents. Our beautiful private and companion suites are bright and cheery, with cozy carpeting, handy kitchenettes and private bathrooms with step-in showers. All units come fully furnished, and we encourage residents to personalize their spaces with photos and favorite belongings. At Brookdale Westampton, we understand that cherished pets offer enriching companionship and we welcome small animals in our homelike community. The common areas of our campus are ideal for the many group activities that offer a sense of purpose, meaning, belonging and, of course, fun. Residents can freely explore many common areas by relaxing in the sun room, enjoying a book in a quiet corner of our library or tending plants in the community garden. The enclosed outdoor courtyard is a beautiful place to stroll in safety. Our memory care program is specially built around maintaining structure in each day, while still offering the mental and physical stimulation our residents require for good health. Nurses are on call 24 hours a day and caregiving staff are always available to assist with the personal needs of our residents. We offer a unique dining program recognized as “Best of the Best” in the industry, designed to help residents successfully enjoy the dining experience. Brookdale Westampton is a community that will care for your loved one with understanding, regard and compassion.